And it's another project I get to mark as finished! My Turkish bed socks! Footies are rather hard to photograph attractively, but I did what I could. 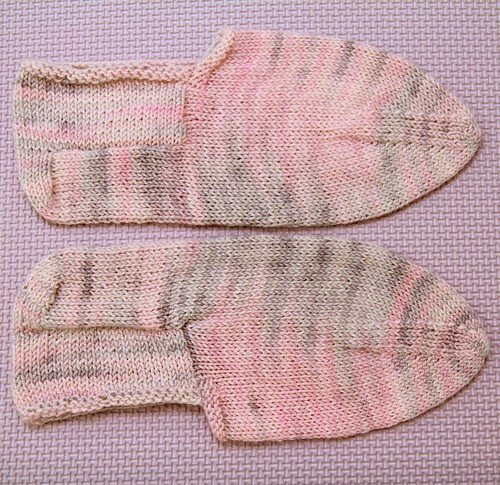 You can see how they actually fit on my Ravelry project page (link above) if you are just dying to see them being worn. Anyway, it was a really neat, quick and interesting project. Honestly, I think I could totally make them again without wanting to claw my eyes out (somewhat of a rarity as I'm usually not one for repeating patterns). I swear, someday something non-knitting related will happen in my life and I'll post about that. Promise!